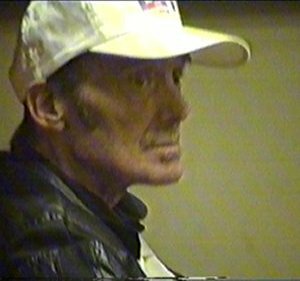 Heinz Burt performed his final set in a social club in Hampshire on 24th March, 2000. 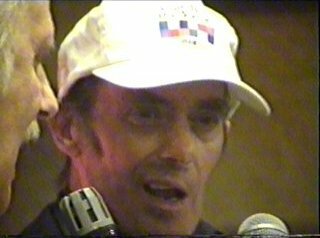 Seated in a wheelchair, to which he was confined through motor neurone disease, he sang Whole Lotta Shakin' Goin' On, Three Steps To Heaven, and his biggest solo hit, Just Like Eddie. He died on 7th April, after a stroke. Aged 57, the days of hit parade riches were long gone, and Heinz had £18 to his name. About 150 people attended his funeral at Eastleigh Crematorium on 15th April. 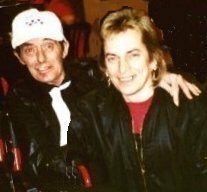 Heinz was dressed in his stage clothes for the final time, and Telstar was playing on the loudspeakers in the chapel. 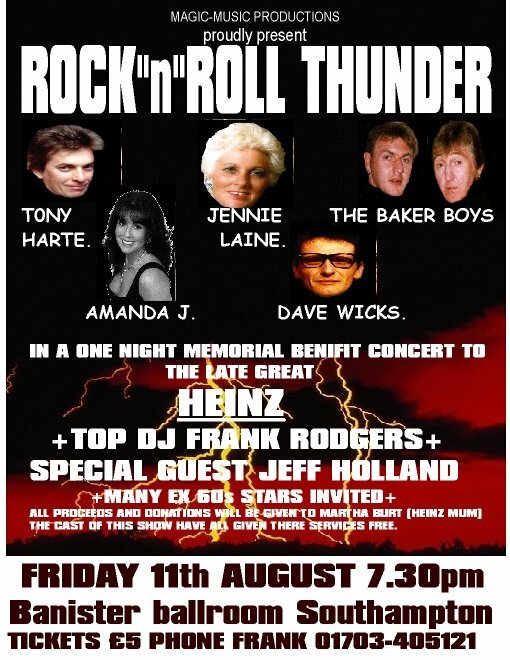 A benefit concert, to help raise funds for Heinz's mother, Mrs Martha Burt, was at the Banister Ballroom, Hulse Road, Southampton, on Friday 11 August. The artists, who gave their services free, were Tony Harte, Jennie Laine, the Baker Boys, Amanda J, Dave Wicks, DJ Frank Rogers and Jeff Holland. Below are links to a sound file and video files of that final set, created from a video shot by singer Tony Harte. The videos and still images appear with the permission of Heinz's mother. 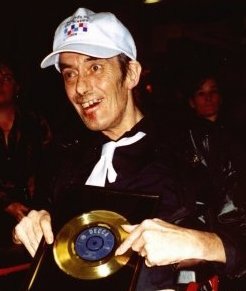 The final one, showing Heinz holding his gold disc for Telstar, is believed to be the last photograph ever taken of him. 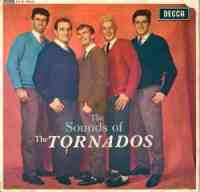 The Tornados, in which Heinz played bass guitar, backed Billy on some tours, and the relationship inspired the title of their debut single, Love And Fury. In 1962, they were backing Billy and John Leyton on tour, and were so little-known that they did not even have their own spot. At the insistence of Joe Meek, they drove from Yarmouth, recorded Telstar in 90 minutes, then drove back for the show. (They were in such a rush that they did not lay down a satisfactory keyboard track, which was added by songwriter Geoff Goddard.) The rest, as they say, is history, as Telstar topped the charts on both sides of the Atlantic,and eventually sold five million copies. The following year, Heinz went solo, and had a massive hit with the Eddie Cochran tribute Just Like Eddie, which was written by Goddard. Whole Lotta Shakin' Goin' On (video). 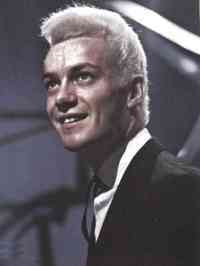 Eddie, which he recorded for Joe Meek. Heinz tracks in Real Audio. Myself and my family were very fond of Heinz and he stayed with us on many occasions. 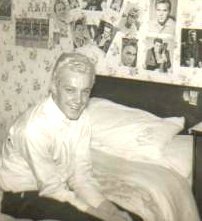 The picture was taken in our spare room taken round about the time of Telstar fame. One memory I have of Heinz is that one morning after he'd stayed over, I had to go to work. He was still asleep. I worked as a comptometer operator across the road from the pub where I lived as a comptometer operator. It was the middle of winter and I'd gone to work with a hot water bottle in my gondola basket to put my feet in under the desk. When Heinz got up, probably around 11am. while my Mam was making his breakfast, she asked him to bob across the road with a fresh hot water bottle for me as she thought the one I'd taken had gone cold. (She was very considerate, my Mam). Heinz walked into my office and all hell let loose. Girls were screaming all over the place. He took it all in his stride - signed autographs and left carrying the cold hot water bottle.